We still have a few days left in the 31 Days of Love Series!! What a month it has been to date. 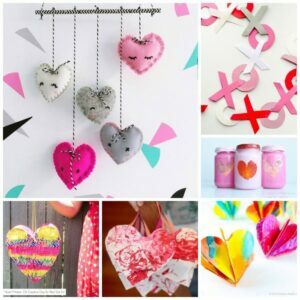 Simply beautiful, wonderful, stunning and FUN FUN FUN crafts. I do have to say a big thank you to everyone already… but… it isn’t over yet. 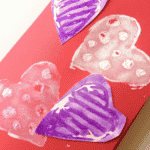 Today we have some gorgeous Button Heart Gift Wrap from Adventure in a Box. These button hearts are simply GORGEOUS. 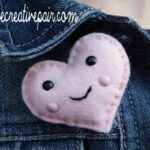 I am almost tempted to say – sod the “gift wrap” – make this as a DIY Button Heart Art canvas and then you can keep it forever!! 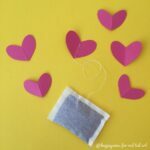 These would make great Valentines Day Decorations too! Hello! I’m Liska from Adventure in a Box, a blog dedicated to family crafting. In our house, Daddy builds wooden puppet theatres, Mommy paints peg fairies, and our son makes nature collages. Life is busy, but we try to add a little bit of creativity and adventure to our “everyday”. When we wrap presents, most of them get wrapped quickly – between throwing together lunch and washing up after. But we like to choose a few presents to wrap them with special care. It’s fun, and our son likes to participate! For Valentine’s Day, we decided to make a special gift wrapping with buttons. 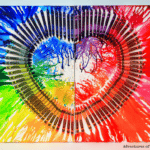 There is colour sorting and sensory tactile play involved for kids, but it’s also a peaceful artistic project for adults. I find myself enjoying buttons just as much as my three-year-old does. 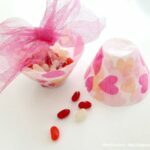 buttons, beads and glitter in pink, white or red (or all of the above) – sorting them is part of the fun! 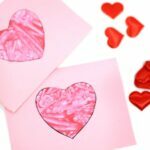 Draw the outline of a heart on the back of wrapping paper, so that the heart will be in the centre of the present once it is wrapped. Cut out the heart with scissors. Assemble buttons on the sticky surface any way you like! Little beads go between buttons, and when there is no space left, my son likes to sprinkle glitter on top.Stick packing tape to the back side of the wrapping paper, so that the sticky side is exposed through the cutout. Wrap the presents and add matching bows, ribbons, Washi tape and gift tags. While wrapping these presents took longer than usually, everyone was involved and enjoyed the process. My son was very proud of how he added some special touches to the presents. Now, waiting to give them away will be the hard part. 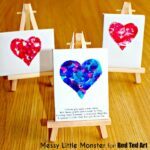 Want to make more crafts for kids and with kids?